Mary Beard’s television programmes are about the ancients and not the presenter, which is a nice change. Beard does insert herself into her excellent work, “Pompeii”, but only to ask the questions which the reader would ask. If you want to know what (we think) the Pompeiians ate (they loved dormice and a revolting fermented fish sauce called garum), drank (lots of alcohol), ) and watched (horrible gladiator and animal maulings), then this is the book for you. There is unavoidably, a lot of supposition in the recreation of the life of the ancients. Some of it seems a bit dubious (determining which streets were one-way by the scrapes left by carriage wheels on corners) and much of it is ludicrously salacious – Beard does not accept that each carved or painted phallus pointed to a brothel. For reasons which are not clear to us, the Pompeiians loved to decorate everything with penises. They just loved it. If each of those which is left demarked a brothel, there would have been little room for other enterprise. The most interesting chapters are those concerning the styles and decoration of houses. It is surprisingly difficult to determine the uses of rooms in the houses because these ancient Romans did not dedicate particular rooms for strict purposes. as we do. They often painted garden walls with wild and exotic jungle and animal scenes. In fact they painted everything – their houses were eye-peelingly garish and they grafittied walls both inside and out. Beard recreates the life of these people with charm and liveliness. As mentioned above, some of the supposition seems like wishful thinking – a detailed analysis, for example of what was happening in one room of the House of the Painters at Work just at the moment that disaster struck – almost two millennia and many tonnes of rubble ago. Life may have been nasty, brutish and short for slave and the desperately poor, but the families who lived in the fashionable, multi-storey House of the Faun or House of the Golden Bracelet (with a sea view) lived with vast entertainment suites, lavish dining areas and water features. Large areas of Pompeii remain uncovered – what fascination and re-evaluations we will encounter when this is done. Beard starts her book with an evocation of families caught by the volcanic bombardment as they were fleeing the city. Our one criticism of the book is that it does not explain how much warning citizens had, how many had fled before the deluge and how long the destruction of the city took. We do know that one poor dishlicker got left behind, chained. 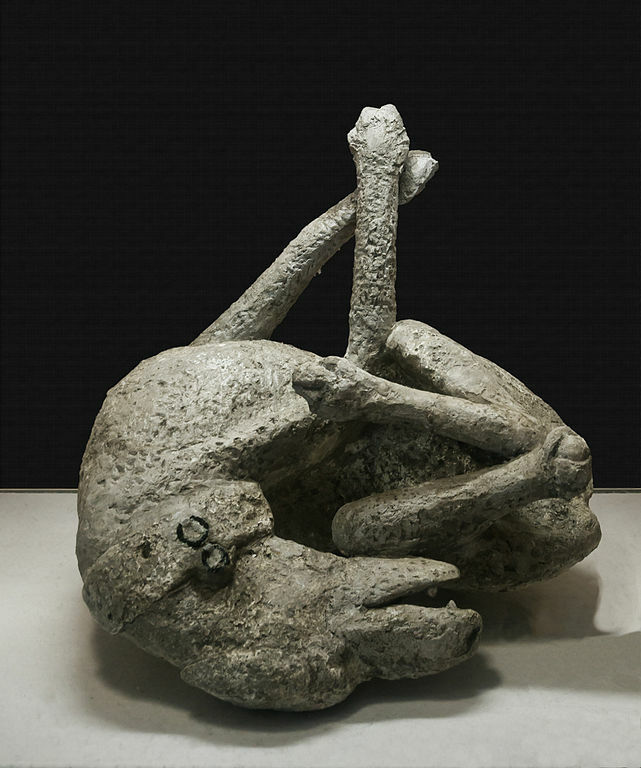 There were plenty of dogs in Pompeii – painted, mosaic and flesh. And to many a modern visitor it seems that the strangely silent white dogs which slink about the ruins today are their ghosts.